Carpal tunnel syndrome occurs when the median nerve becomes squashed, or compressed at the wrist. 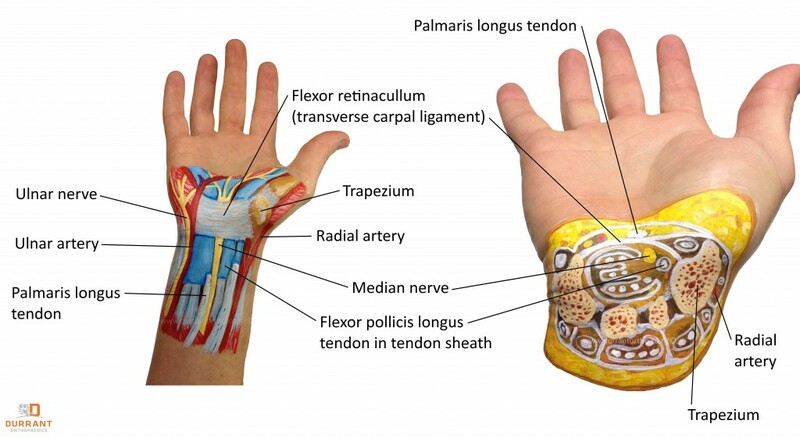 The median nerve runs down the inside of the forearm and into the wrist. It supplies feeling to part of the palm, the thumb, the first two fingers, and the inside half of the ring finger. It also supplies motor function to part of the thumb. Carpal tunnel syndrome can cause numbness, tingling and weakness in the affected hand. The point at which the nerve passes through the wrist from the forearm is called the carpal tunnel. This tunnel space is very narrow, and can often become narrower if even the slightest amount of swelling occurs. This then causes the nerve to be compressed, causing the symptoms of carpal tunnel syndrome. Repetitive movements of the wrist, such as typing, writing, painting, sewing, playing certain musical instruments, or certain racquet sports can all cause the carpal tunnel to become inflamed. Other causes of carpal tunnel syndrome may include diabetes, excessive weight gain, arthritis, pregnancy, or an injury to the wrist or forearm. The most significant symptom of carpal tunnel syndrome is numbness and tingling in the affected area of the hand. Usually this numbness is intermittent, and often occurs during the night while sleeping, or after repetitive use of the wrist. It generally does not cause significant pain, only discomfort from having a numb hand. However sometimes people do experience some pain in their wrist, or up into their forearm and elbow. Weakness of the hand, especially when trying to grip something with any strength. In chronic long term carpal tunnel syndrome muscle wasting in the thumb half of the hand, due to lack of use, may be experienced. Wearing a splint to support the wrist and stop flexion of the wrist can ease the condition. Ideally the splint should be worn at night and when performing the movements that caused the problem initially. Mr. Durrant may suggest the use of hot and cold packs to offer relief. Making changes to the movements that are the cause of the syndrome are also important to ensure the problem does not become chronic. Changes may include using a wrist support when typing on a keyboard or using a mouse. Non Steroidal Anti-Inflammatory Drugs (NSAID’s) such as ibuprofen may work to reduce swelling around the nerve. If these do not work, then a steroid injection may provide relieve from symptoms for a few months. Carpal tunnel surgery is relatively straight forward and can be performed either endoscopically, where a small camera is inserted into a small incision, or open, which involves making a small incision about two or three centimetres in length into the wrist. The ligament that creates the carpal tunnel space is then divided in order to release the pressure on the nerve and increase the tunnel space. For the majority of patients surgery is successful in treating carpal tunnel syndrome. Carpal tunnel surgery is very common and is usually performed in a day-surgery unit, where there is no need for any overnight stay in a hospital. Often patients can experience relief from their symptoms immediately. However care needs to be taken for a few weeks post surgery in order to give the wrist time to heal properly. Physical therapy for the weeks following surgery will ensure the wrist regains full strength and range of motion. The chances of carpal tunnel syndrome recurring after surgical treatment are rare, and the majority of patients make a full and complete recovery within a short period of time. Carpal tunnel syndrome is a very common condition. Mr. Adam Durrant offers experience and expertise in accurately diagnosing and effectively treating carpal tunnel syndrome. Mr. Durrant will be able to offer the best course of treatment for your condition, whether surgical or non-surgical in order to provide relief from the symptoms you experience. Contact Mr. Adam Durrant for more information on carpal tunnel syndrome or for additional resources on other hand and wrist related injuries.